This comes up every now and then, but recently, it seems to have popped up a good bit in the past few days for me. The use of profanity when talking about and promoting the hobby. Let me clarify quickly, I'm not talking about language used at work, at home, or elsewhere... I'm talking about language used and seen in the greater 40k blogging community. When I started the FTW Blogger Group, I decided that the use of profanity was not necessary in order to promote the hobby. I also decided that I would not include blogs or allow blogs to join the FTW Blogger Group that used profanity on their sites. I go so far as to remove blogs from the Group blogroll when I find profanity in them. But all of this is made clear when someone looks to join and they read the expectations of the Group. I don't believe in censorship, but I will not promote 40k sites that use profanity. This is a matter of personal opinion. I do NOT believe I have the right to tell others what they can and cannot post on their blogs or how they can or cannot talk about the hobby. I am simply choosing how From the Warp will promote the hobby. I do believe that most blogs have something to offer. Even if I don't agree with how they are presenting it. Would I like to see the material presented differently, sure... I think it would help the hobby more than using profanity to get the point across. But once again, that's just my opinion and people have the right to cover the hobby in the way they feel it should be done. Now, I'm not going to go stick my head in the sand and pretend it's a perfect world. 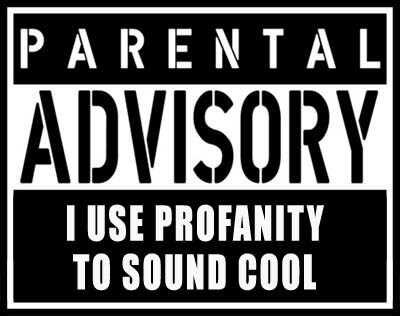 There are lots of FTW members that link to, visit regularly and even promote sites that use profanity. I know this. I can only control what happens on FTW. From the emails I've received over time, I know that readers appreciate the fact that there is no profanity on FTW. While FTW will continue to promote all of the FTW Blogger Group members AND the greater 40k blogging community, it will be with this one small caveat, that it's done without profanity. So, if you wonder why you never see links to certain blogs here on FTW, now you know why. The game is better than profanity, we shouldn't have to reduce ourselves to using it to promote our hobby. Totally with you on this! You are dead on here, Ron. This hobby, by its very nature, is very attractive to a young crowd. Therefore, there is no need to use profanity when youth may be reading. Furthermore, we like to consider ourselves intelligent (for the most part), and look at things analytically. We disseminate tactics, painting techniques, and modeling ideas. In most published media, it is a unspoken and unwritten rule that it is very improper to use profanity in any sort of professional piece of writing. I don't believe in censorship either, but this isn't censorship. This is filtering, like a parental control. I support this 100%. If you were censoring our blogs, you would be removing them from existence. This is not the case, you are just choosing not to promote blogs that make use of profanity. It could be worse: you could be deleting blogs that state a thesis or idea that you don't agree with! Keep it civil, folks. It's not too much to ask. I'm with you on this one, must admit, I noticed the F word on the blogroll a little while ago and thought we'd have a post like this sometime soon. I'll be honest, I swear like a troop, I really do but there's no need in the presence of minors, on or offline. If I really want to make a point, I'll use Dan Abnetts F word - Fethin! Ironically, I normally play at a club that's over 18's only and other than after a few drinks in the bar afterwards, no one really swears whilst we're playing. Whereas I walked out of GW shrewsbury once with my 4yo because of the language of the kids in there. Yup - I agree...although it's something I'd forgotten you practised. By the way, everyone: thanks for all continuing to be such good sports - I've yet to notice trollishness stemming from FtW, and it's always extra rewarding to be a part of something so constructive and pleasant. I prefer no profanity. I wish all bloggers could post their thoughts without resorting to foul language. Unfortunately, not everyone takes the time to elucidate their thoughts in an eloquent fashion. Too many people use a 10lb hammer when what they really need to use is a nail file. but having said that, I admit that one of the blogs I do check often does not restrict language, and I know that when I go there. It still makes me wish people would consider finding better words. like my Dad used to tell me: "You are inteligent. Use eloquent words. Cretins cuss. You're not a cretin" Yeah, he was covered in grease and dirt, in 100 degree heat, doing field repairs on farm machinery, and we were both pretty frustrated with the situation. It takes more effort to express yourself without expletives, but when you make the effort, you are better understood. I like to think my words and thoughts are worth the effort. I hope other members of the blogging community feel their thoughts are worth the effort as well. I also don't care for mud-slinging between blogs, but that's an entirely different topic relating to community. My daddy taught me my best swears. He was a poet with profanity. I swear like a drunken sailor IRL. But it doesn't really belong here. "I don't work with blue material." and all that. If I were to use profanity, it'd be of the funky symbol variety( i.e. ; %^&*%! !, which while it is ambiguous, I would keep that to a minimum. I want to at least appear inteligent and well-spoken. Do people actually have blog wars on warhammer blogs? how ridiculous is that? Well, I cuss like a sa.....Marine. What can I say, I was one. And trust me I can string profanity togather from about 5 languages. However....I agree there is no need for profanity on a blog about a Game system and miniture building. Ron, and the rest of the Blog roll members, I salute you for this. And I hope to be able to keep in good standing by not resorting to said usage. Well stated by everyone, i am glad to see that we can enjoy the hobby we love(well I do at least) with out resorting to lowering our image and intelligence with words that have no class or tact. As everyone else, i also curse, but I have small children and really have to monitor what I say and soon enough what i type too, and it helps to not have to read any more trash talk than what the "internet tough guys" already put up. If frustration gets the best of me, I too use the funky symbol gesture, to get my point out, in a brief manner and then move on to important things. We all have enough stress in our lives, i use this hobby to relieve that stress, not increase it. Sorry to babble on, WELL DONE FTW! Totally agree. When you're writing it's totally different from speaking. You usually have a long time to put down your thoughts in a way that will get your points across and reverting back to cuss words are just showing that you should think a bit more how you want to present your text. Unless you want to sound like the neigbourhood tough guy and well. I think there are better ways to get the point across. They just words. We can say we're "thinking of the children", but in the end they're just words that make us uncomfortable. Just because someone says fark instead of F*** does that change the intent of that word? To me it's unessesary baby talk. But it's your blog Ron, and your blog your rules. I've written and deleted about six drafts of response... I'll go with the short version: As GMSN says, "Your blog, your rules." Searching my blog only turned up one "four letter" word and it was a quote of someone else. (Since removed.) I may not entirely agree, but I respect your right to choose this. If it is any consolation, I had debated the inclusion of that link quite a bit for this very reason. I opted to go with it and let people make their own decision, but understand your choice against. For my part in this, my apologies. One of my own personal hobbies is creating compound foul language. I have gone well beyond the mundane 4 letter variety and have resorted to sewing them together to form Frankenstein-esque swears. HOWEVER, this has a place and a time. You don't say stuff like that in public places as a matter of etiquette. This is a public place, therefore no swears. I appreciate your rule. I was a bit surprised at this post to be honest. I see that support and agreement are a plenty and it seems to me that it is more the case of a group of people who feel comfortable in and around this corner of the internet. I do. I read a number of blogs on a regular basis and it's a warm fuzzy place. My opinion is that this is the reason why it is worth protecting "our" world. We collectivly want to write, read, and comment in an atmosphere where we feel at home and welcome. So why the surprise? Because I don't really put any danger in many of these words. I use the words I need to express myself and that suits the situation. I think there is a difference between how you act, and what subset of words from the language you use. You can have funny, warm, whitty (sp) people with a vocabulary with an emphasis of words with a sexual and religious nature. You can also have cruel, intolerant, and backstabbing people using only the most refined of vocabularies found in their language of choice. So I am wondering if it is the words they use or the way they act that you object to Ron? I wanted to ask that before I let you know that I support you, because I have the feeling that you want to make "our" Internet corner better and I support that. A lot. In fact feel free to add my blog to your blog roll, if you think others might enjoy it. I don't think there is any espacially strong words there really. I do ask one thing of you though, please let people know why you might remove them. It might be unintentional how they write and it could be that they rather "clean up" than get left out. On the subject of children. Monkey see, Monkey do. Be a role model, be it gaming behavior of vocabulary selection, and reward good behavior and ignore bad. Those kids are future players and bloggers for us to fill our ranks with after all. I'm with you on this one Ron. I find no problem not using swears in my blog. In fact it would hinder me to use swears as I send potential customers to my blog to look at my work. Either way I think it was a great idea for you to bring this issue to light, cheers! I feel that words only have the power that we give them. Cursing does not usually bother me. That said, there is such thing as tact and consideration of other people for whom certain words do hold some special power or meaning. It always amazes me that some people spout curse words saying it's no big deal if it offends some people, but who would not even think of spouting racial slurs to their friends of different ethnicity. Do I curse in real life? Yep. Do I curse in front of my mother who is highly offended by cursing? Not too often. It's consideration. And being considerate, as well as fun, educational, and entertaining is what I appreciate about the FTW group! GMSN: You are correct, they are just words. When I read another blog, I don't presume to know the intent behind every word used. I figure they took the time to type it, proof it and then publish it, so they must have chosen their words for a reason. Like it or not, agree with it or not... we are all to some extent role models and examples for others to follow in this hobby. We all blog for our own reasons just as we choose our words... for our own reasons. But what we do, both good and bad (especially when you make it public by blogging), reflects on our hobby. In my line of work (in the real word) I use the language I need to so that I'm able to get my job done as quickly and efficiently as possible without anyone getting killed. FTW is not the real world. I do not use the language here that I use in the real world. I know that FTW has grown to a point where it may be a role model for some people. FTW, like all other blogs, can be seen as a reflection of the person and the hobby. For that reason, you will not see politcal statements, religious discussions or other topics not related to the hobby or blogging. For that reason, I choose to use certain language. And for that reason, I will require others who choose to be part of FTW to do the same. I knew that by posting this, it may very well bother some folks. I am perfectly fine with that and take full responsibility for imposing this rule. I encourage the discussion and appreciate everyone's opinions on this... regardless of whether or not we agree. But the rule will not change. Flekkzo: When FTW members choose to join, the use of inappropriate language is covered in the post with all the rest of the joining information. I can only hope that someone who chooses to join an organisation takes the time to read everything pertaining to it before they get involved. As a matter of fact, I had to explain this very thing to someone today. Why their blog had been pulled from the list since they did not see themselves on the roll. If you've read the expectations of the Group, then there will be no suprise when you post foul language and your blog is taken down from the roll. Once again, thanks guys, I appreciate the civil discussion. Excellent post Ron, I totally agree with you as well. We're talking about a hobby for children of all ages, so it should be kept friendly and suitable for all of them. Naturally the odd word here and there happen, but there's no reason why all of us can't just discuss the hobby in a civilized manner. Who knowns,we may even convince the many sceptics out there that our favarite passtime really is something special and constructive! You're talking about an adult game where intolerance, cruelty, violence, genicide, xenocide, and more are quite common. Think about it. I don't cuss on my blog(s) b/c I don't see a reason to portray myself like that. Making a rule is cool man, I'm all for it. This post is a bit much though. I don't agree with you, but...it's your blog, and you call the tune. If I don't like the music, what's to keep me listening, right? I personally love the proper use of profanity. Sometimes only a swear will do. But I also like this blog, so I'll play by your rules when I'm here. lemonruss: I appreciate the understanding.